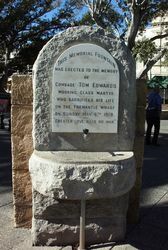 A fountain commemorates Tom Edwards who died in a union riot. Fremantle in 1919 was the scene of an extraordinarily violent riot. Western Australia was isolated by a seamen`s strike and an outbreak of the deadly influenza virus. In the potentially explosive ‘Battle of the Barricades’ riot on Fremantle Wharf on 4 May 1919. Hal Colebatch, who had taken over from Lefroy as Western Australian Premier just the previous month, had intervened in the dispute over the unloading of the coastal trading ship " SS Dimboola" and violence escalated when members of the Fremantle Lumpers Union threw missiles and stones from Fremantle wharf at launches carrying the Premier and labourers who were planning to erect barricades to allow National Waterside Workers Union members to unload the ship. Police retaliated with missiles and bayonets, shots were fired and a tense stand-off with sporadic violence ensued. There was the added danger that soldiers on the troopship "Khyber", which had just entered the harbour, might be drawn in to support the Lumpers Union .The riot became know as "Bloody Sunday". During the riot Edwards was mortally wounded and died 3 days later giving the union its first martyr. At the time of his funeral, industry workers throughout the state stopped for 3 minutes reflection. Bill Renton, the union president, with his head still bandaged, led the funeral procession on horseback from Fremantle Trades Hall to the Fremantle Cemetery. His wife and 3 children continued to live in Fremantle after his death and received donations of food from land farmed by the Industrial Workers Union. 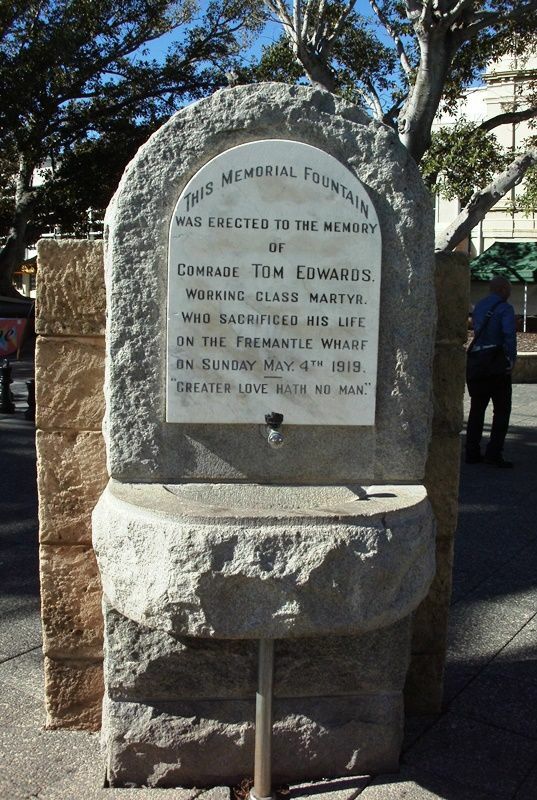 This memorial fountain was erected to the memory of comrade Tom Edwards. Who sacrificed his life on Fremantle Wharf on Sunday May, 4th 1919.